Brad Trost, Member of Parliament for the Saskatoon-University riding was in Manitoba for part of the Labour Day long-weekend attending to a few speaking engagements in the province. 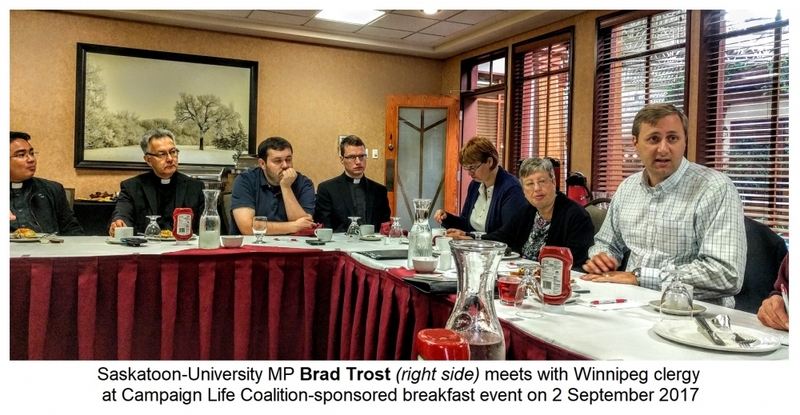 One of the engagements was a roundtable discussion with Winnipeg clergy that was organized by the Manitoba branch of the national Campaign Life Coalition. Parish priests, pastors and church elders, representing a number of the city’s Christian denominations, gathered at the Fort Gary Canad-Inns for a breakfast discussion. The Archeparchy of Winnipeg was also represented. After a brief introduction by the Member of Parliament, everyone had an opportunity to share ideas, concerns and information. Trost invited those present to look beyond the horizon and see what social and bioethical trends will be coming down the road in the very near future. A number of concerns were discussed that touched upon life issues, such as abortion and euthanasia and the rights of doctors’ and citizens’ in their regard. Some also raised social trends such as concepts of marriage, family and gender issues. Religious freedom, of course, was also discussed as to how it might be protected and what efforts may be made in the near future to curtail it. Everyone left very satisfied with the opportunity to have a forum to discuss matters of concern with a Member of Parliament, as well as the chance to meet and network with fellow leaders in the city’s Christian community.